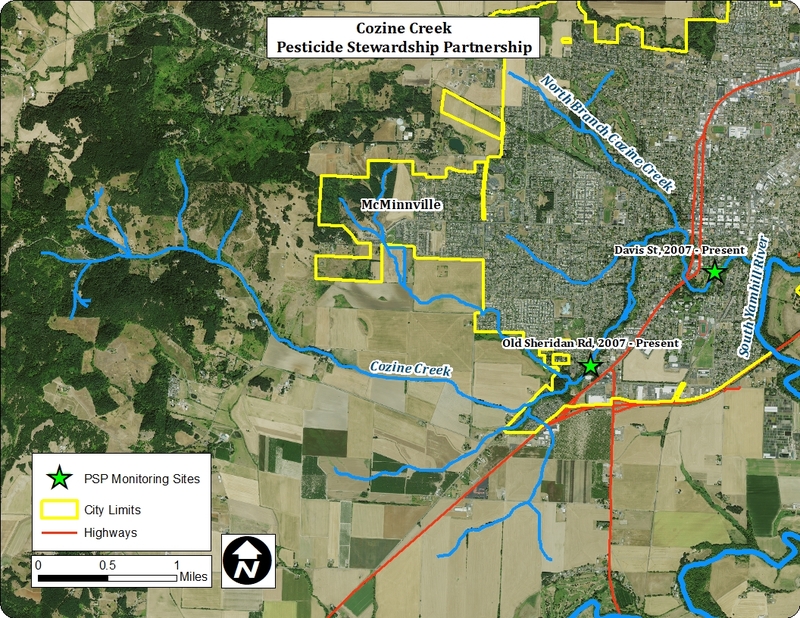 The Yamhill Pesticide Stewardship Partnership (PSP) was started in 2007 and is a non-regulatory approach to try and reduce pesticide concentrations in surface water. 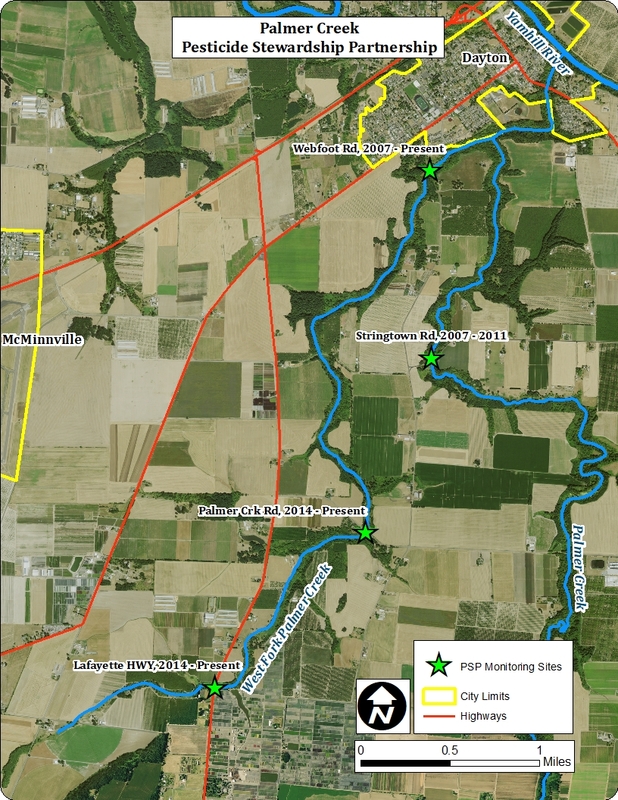 Initially, 8 sites were sampled across Yamhill County to assess the need for further monitoring. The data indicated that Palmer Creek and Cozine Creek showed higher concentrations and frequencies of detection and have since been the focus of local monitoring efforts by state and local partners. The Pesticide Stewardship Partnership includes Oregon Department of Environmental Quality, Oregon Department of Agriculture, The Greater Yamhill Watershed Council, The Yamhill Soil and Water Conservation District, Oregon State Extension and local growers. Where are the Sampling Locations? EPA Aquatic Life Benchmark: Aquatic life criteria for toxic chemicals are the highest concentration of specific pollutants or parameters in water that are not expected to pose a significant risk to the majority of species in a given environment.These benchmarks are based on toxicity values reviewed by the EPA and used in assessing environmental risk as part of the pesticide registration process. Oregon Water Quality Standard: These standards are established by Oregon DEQ and serve as benchmarks to protect human and aquatic health. They are set to protect the most sensitive use of the water body, eg. Temperature standards may vary whether anadromous fish use the system. Over 100 pesticides and breakdown products are tested throughout the summer in the Palmer and Cozine Creek watersheds. What are partners doing to assist growers? Continued monitoring of water bodies for pesticides and provide the public with opportunities to get the monitoring data and ask questions.